Chongqing Haoyida Outdoor Facility Co., Ltd., was founded in 2006 which has more than 11 years’ manufacturing experience. Our factory covers an area of about 5400 square meters and employs more than 100 people, with the world's leading production & testing equipment, cutting-edge product development concept and advanced manufacturing technology. Our aim is to produce and sell the highest quality outdoor furniture, and provide customers with the best service. Our main products are trash bins, outdoor benches, outdoor tables and chairs, rattan furniture, flower pot, beach chair, etc., We can meet your one-stop outdoor furniture purchasing needs, also support customized design. we control the entire process including quotation, production, manufacturing, quality control and after-sales service, to provide customers with high-quality products. 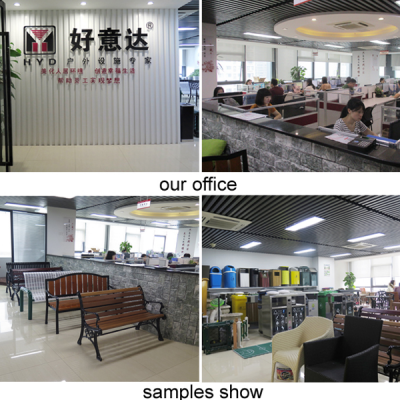 Haoyida has served more than 10,000 customers with our best quality products. Our products enjoy a high reputation in the market.